A tireless runner who gave always 100 per cent for the team, Craig Johnston was part of the 1985-86 double team. Born in South Africa but brought up in Australia, Craig was confident enough in his own ability to write to several English clubs as a 15 year old asking for a trial. Middlesbrough were the only ones that replied and so it was there that he established himself in English football, where his consistency and battling qualities soon brought him to the attention of bigger clubs. 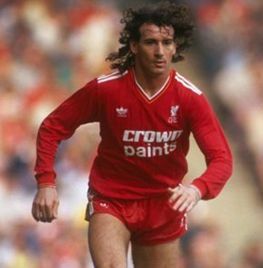 He signed for Liverpool in April 1981, still only 20 years old but with over 60 league appearances to his credit already. When he watched his new club win the European Cup in Paris only weeks after his arrival at Anfield, he must have dreamed of being part of similar success. But the reality proved much tougher and it was only in the second half of the following season (1981-82) that he was given the opportunity to show what he could do. He quickly became a crowd favourite because supporters recognised that he would run until he dropped, but he could also be a frustrating player to watch although his ability, courage and strength were never in doubt. His fortunes started to change on a freezing December night when Arsenal visited Anfield for a 4th round League Cup replay. After being substitute in three of the first four league matches, he had been largely overlooked since then. But his first goal for the club 5 minutes into extra-time helped see the Reds through to the quarter-final, although Craig failed to play any further part in the competition as his team went on to retain the trophy. But he was picked for the first League match after that Wembley success and played some part in all but one of the remaining league matches, contributing six goals as Liverpool regained the championship from Aston Villa. The following season (1982-83) was Craig's most productive as a goalscorer - 10 from 42 starts. He played even more matches the next season but only managed 4 goals although he did get his hands on the European Cup as a player just three years after watching his new team-mates lift the trophy on that night in France so soon after he had arrived at the club. However, it seemed that he was not in favour with Joe Fagan, who had taken over from Bob Paisley, the man who had signed him from Middlesbrough. But when Joe stepped down after two seasons in charge, Craig was given fresh hope and encouragement from his former team-mate Kenny Dalglish, who now had the difficult task of leading the club forward after Heysel. Craig played 61 games in the 'Double' season of 1985-86 and was a key member of the team. The joy of scoring in an FA Cup final was plain for all to see! After a promising start to the following season, the recurrence of a back injury kept him on the sidelines. But worse news was to come that Christmas. His sister was seriously ill in a Morocco hospital and he rushed immediately to be at her side. All this was kept from the Press at the time - and of course the supporters had no idea of the tragedy that was unfolding in his private life. His mind was obviously on other things and although he never gave up when he had a Liverpool shirt on, it was clear and natural that his family came first. Further injuries meant a reduced number of appearances in 1987-88 and he finally left England to return to Australia after making his final appearance in the FA Cup Final against Wimbledon. In seven years at Liverpool he won five championships, the European cup, the FA cup, three League cups and four Charity Shields. Years after he quit Liverpool he was continually being linked with top clubs. He made one thing clear at the time to Liverpool fans all over the world that he would only return for one club: "I'd never play for anyone else than Liverpool. The only other team I'd play for would be Liverpool reserves!" A year later, devastated by what had happened at Hillsborough, he not only raised thousands of pounds in his own country for the Fund which had been set up but also willingly flew half-way across the world to attend the memorial service at Anfield seven days after the disaster and stayed on to help counsel the bereaved families, a wonderful gesture which endeared him to Liverpool fans everywhere. Johnston is a true entrepreneur. He designed the Predator football boot, his own brand of surfboards, became a full-time photographer tried being a music producer, etc... his list of accomplishment is endless. The title of his autobiography "Walk Alone" was apt because in many ways he was a refreshing change from the 'typical' professional footballer. And the fact this his book was dedicated "In Memory of the Victims of Heysel & Hillsborough" showed how much he cared about the community that had accepted him as one of their own and who will always have fond memories of a player who ran himself into the ground in the Liverpool cause.